Vandals ripped a metal gate off its hinges at a Polegate skate park last night (February 12), in the latest in a ‘frustrating’ string of attacks in the town. It was found by the council’s maintenance team strewn in the middle of Brightling Road skate park – the fourth occasion this has happened. Polegate Town Council said on Twitter, “Unfortunately there has been another incident of vandalism at Brightling Road skate park. “The gate has been repaired three times by our maintenance team, following previous vandalism. It has now been vandalised again and ripped off its hinges. But this is not the only area of the town which has been targeted by vandals in recent months. 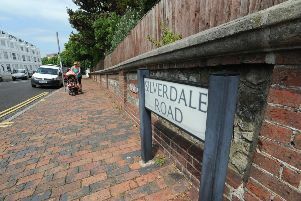 A spokesperson for the town council said in the last year there has been more than 40 incidents of vandalism in public areas in Polegate – including destroying doors to public toilets and an arson attack in Wannock Road recreation ground. Anyone with information has been advised to contact the police. You can do so on the Sussex Police website or by calling 101. If you see a crime in progress call 999.